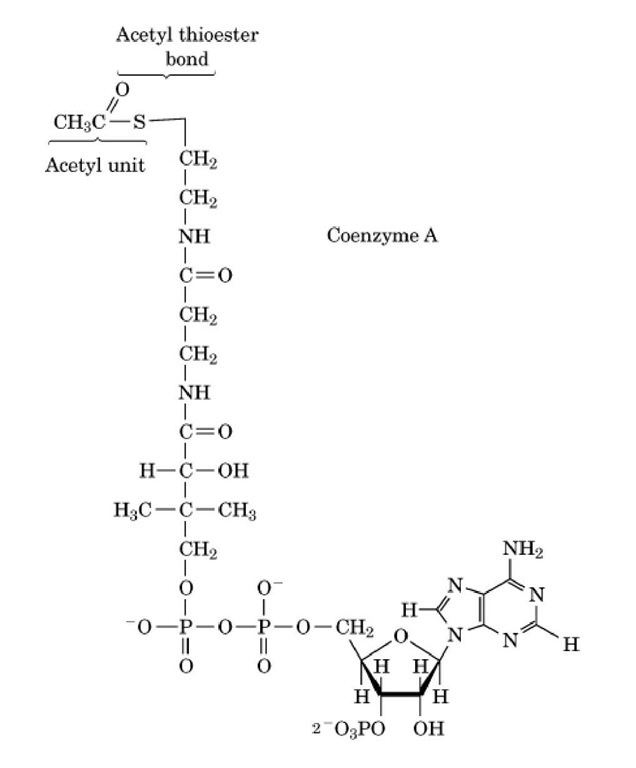 Acetyl coenzyme A (acetylCoA ) consists of a two-carbon activated acetyl unit attached to coenzyme A in thioester linkage. AcetylCoA is central to energy generation from the degradative pathways of oxidative fuel metabolism and to a number of biosynthetic pathways that utilize the activated two-carbon acetyl unit. In aerobic cells, it is the product of all the major catabolic pathways of fuel metabolism, including b- oxidation of fatty acids, ketone body degradation, glycolysis and pyruvate oxidation, ethanol oxidation, and the oxidative degradation of many amino acids. 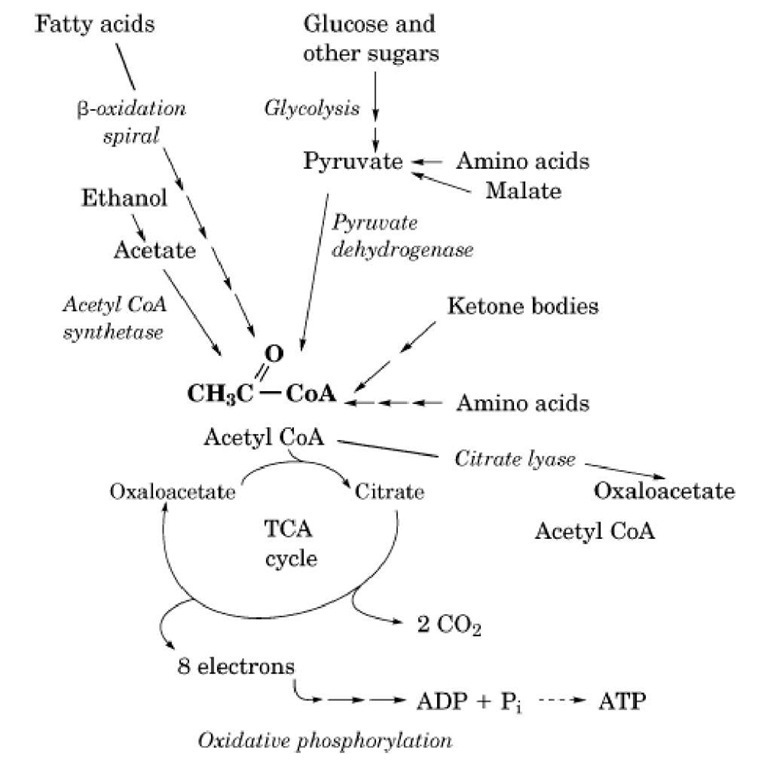 The two-carbon acetyl unit of acetylCoA formed from these pathways can be completely oxidized to CO2 in the tricarboxylic acid cycle (TCA cycle), thus providing aerobic cells with energy from the complete oxidation of fuels. The acetyl unit of acetylCoA is also the basic building block of fatty acids, cholesterol, and other compounds, and it can be transferred to other molecules in acetylation reactions (eg, synthesis of N-acetylated sugars). 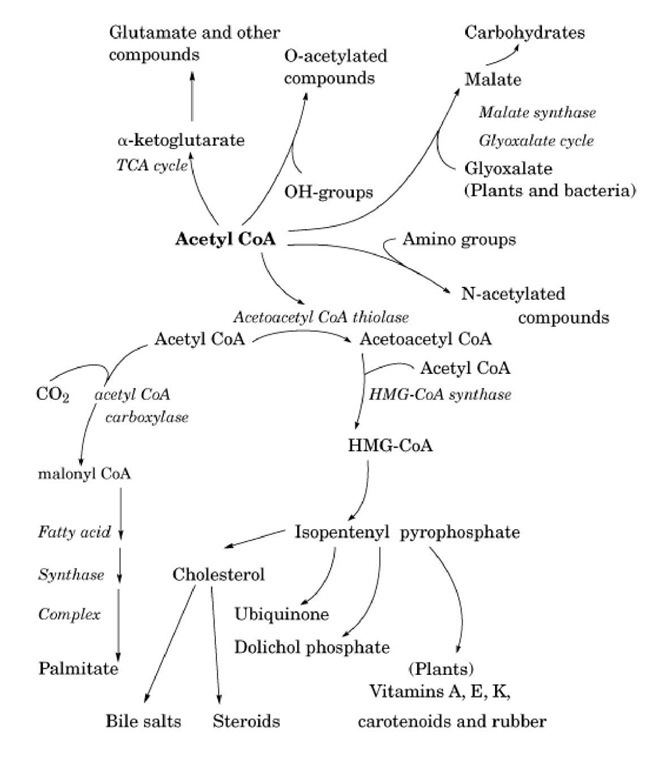 The ability of acetylCoA to participate in these diverse metabolic pathways is derived from the thioester bond formed between the acyl carbon of the acetyl unit and the sulfhydryl group of coenzyme A (CoASH) (Fig. 1). Because sulfur does not share its electrons, the carbonyl carbon of the thioester bond carries a more positive partial charge than that of an oxygen ester, and electrons are pulled away from the C-H bonds of the terminal methyl group. This distribution of charge facilitates nucleophilic attack at the carbonyl carbon and enhances the ability of the terminal methyl carbon to act as an electrophilic agent in condensation reactions. The acetylCoA thioester bond is a O’ high energy bond, with a DG for hydrolysis of -32.2 kJ/mol. Transfer of the acetyl unit to other molecules, therefore, usually occurs with the release of energy. Figure 1. Structure of acetyl coenzyme A (acetyl CoA). Three basic types of reactions exist in the oxidative pathways of fuel metabolism that generate acetylCoA: the activation of acetate, the thiolytic cleavage of b-ketoacyl CoAs and b-hydroxy acids, and the oxidative decarboxylation of pyruvate (Figure 2). In mammalian cells, acetate is the end product of ethanol metabolism and of threonine degradation. It is activated to acetylCoA in a single ATP- requiring step by the enzyme acetylCoA synthetase (Table 1). In an alternate route, bacterial cells can synthesize acetyl phosphate from acetate and then transfer the activated acetyl group to CoASH. Thiolytic cleavage of b-ketoacyl or b-hydroxy acylCoA derivatives to acetylCoA occurs in the pathways for oxidation of fatty acids, synthesis of the ketone bodies acetoacetate and b-hydroxybutyrate, and oxidative degradation of the amino acids isoleucine, leucine, lysine, tryptophan, phenylalanine, and tyrosine. (Most biochemistry textbooks contain general outlines of these pathways.) This type of reaction is illustrated by the b-oxidation spiral for fatty acids, in which one molecule of the C^-fatty acid palmitate is converted to eight molecules of acetylCoA by enzymes that sequentially oxidize the molecule to a b-ketoacyl compound and then cleave acetylCoA from the carboxylic acid end (Table 1). The third type of reaction, the oxidative decarboxylation of pyruvate by the pyruvate dehydrogenase complex, provides the connecting link between pathways that produce pyruvate and the TCA cycle. The inhibition of the pyruvate dehydrogenase complex by acetylCoA has a regulatory role in controlling the flow of carbon into the various pathways of intermediary metabolism. Figure 2. The role of acetyl CoA in oxidative fuel metabolism. Most of the pathways that produce acetylCoA in aerobic cells of eukaryotic organisms are located in the mitochondrial matrix, and most of the biosynthetic pathways that utilize acetylCoA are outside of the mitochondrion. AcetylCoA is not directly transported through the inner mitochondrial membrane but is "transferred" from the mitochondrial matrix to the cytosol as citrate. It is then regenerated in the cytosol by the enzyme citrate lyase. The two-carbon acetyl unit of acetylCoA is the precursor of a number of compounds synthesized in cells. It is the basic building block of fatty acids, cholesterol, and other compounds derived from the five-carbon isoprenoid unit (Figure 3). In the synthesis of fatty acids, acetylCoA is carboxylated to malonylCoA by the biotin-requiring enzyme, acetylCoA carboxylase (Table 2). Subsequent reactions build the C^ fatty acid palmitate and other fatty acids from successive additions of the portion of malonyl CoA derived from acetylCoA, thereby providing the cell with the diverse fatty acids required for membrane lipids. In the synthesis of cholesterol, acetyl units from three acetylCoA molecules condense to form 3-hydroxy 3-methylglutaryl CoA (HMG CoA), which is subsequently decarboxylated and converted to the five-carbon isoprenoid unit isopentenyl pyrophosphate. This isoprenoid unit is one of the most common structural units of a number of compounds in mammalian cells, bacteria, and plants. AcetylCoA also contributes one carbon to compounds synthesized from the five-carbon intermediate a- ketoglutarate in the TCA cycle. The acetyl unit of acetylCoA can also be transferred either to hydroxyl groups of compounds to form an acetyl oxygen ester (eg, the neurotransmitter acetylcholine; see Acetylcholine Receptor) or to an amino group to form an amide in an N-acetylation reaction (eg, acetylated amino sugars such as N-acetylglucosamine). Figure 3. The central role of acetyl CoA in biosynthetic pathways. In mammalian cells, acetylCoA cannot provide a net source of carbon for the synthesis of glucose or other sugars. However, plants, yeast, and bacteria contain the glyoxylate cycle, which serves as a bypass of the TCA cycle. 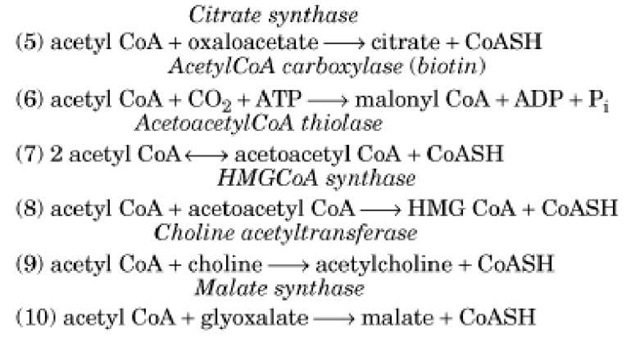 The net result of the glyoxylate cycle is the conversion of two molecules of acetylCoA to succinate, utilizing TCA cycle enzymes plus isocitrate lyase and malate synthase. As a result, Escherichia coli and many other bacteria are able to convert acetate to carbohydrates and amino acids and can thus utilize and grow on acetate as their sole carbon source.